Even at the height of the global financial crisis, France remained one of the most popular emigration destinations in Europe and thousands of foreign nationals purchase French property every year in order to enjoy the country’s great food, beautiful and varied countryside, favourable climate and colourful history. 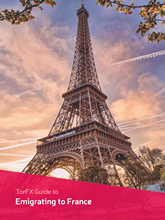 With French property prices varying markedly from region to region, it really pays to have excellent exchange rates on your side – and that’s where TorFX can help. Our exchange rates are highly competitive and unlike banks we don’t charge transfer fees or commission so you can get much more for your international money transfers with TorFX. Whether you’re looking to invest in a commercial or residential property, staying on top of the latest currency exchange market news can help you time your transfer more effectively and secure a better exchange rate. While tracking exchange rate shifts yourself can be time consuming, TorFX eliminates the hassle by sending you regular market updates via email and keeping you abreast of any developments which could impact your transfer. Signing up to our updates is free and comes with no obligation to trade. Once registered with TorFX you’ll also be assigned an Account Manager to offer additional support and guidance. You may want to look into the option of fixing a favourable rate in advance, giving you time to conduct your French property search without fear of negative exchange rate movements. Additionally, our regular overseas payments service is ideal for making monthly mortgage payments or to top up your foreign bank account regularly – whatever your requirement we can help. Achieving a excellent Euro exchange rate will leave you with more money to invest in your French property so it’s well worth taking the time to talk things through with market-leading professionals. Emigrating to France? Our free guide is full of top tips to help you navigate the foreign property market and provides useful information on subjects from locations to moving your money.